Shredders are classified by the type of shred that they produce, which in turn, is directly affected by the type of cut that they impose. The three most common types are; strip-cut, cross-cut, and micro-cut. The strip-cut machines shred long vertical pieces, as cross-cut adds horizontal cuts to make the shred pieces even smaller. Micro-cut machines shred to an even higher level of security essentially rendering your documents to tiny particles. All of these lines are available in the industry's leading brands including HSM, Fellowes, Swingline, and more. Choose by whichever option lines up best with you or your organization's needs. Welcome to MyBinding video. 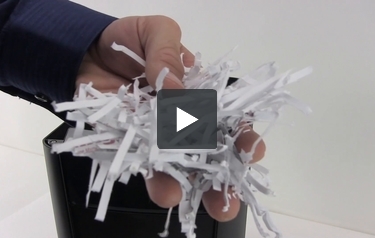 Among the most popular ways to choose a paper shredder is by its type of cut. And just as paper shredders do not all look the same, they all do not produce the same cut. In short there are three different cut styles - strip cut, cross cut and micro cut. Long, thin, narrow strips the length of the page is what’s called the strip cut. It’s not very secure and found in many small shredders; used for personal or very small office use. Climbing up the security ladder is the level 2 to 3 cross cut shred. When shredding paper here, it’s not only vertical but also horizontally cut. The smaller these dices, the higher the security level. And the king of security is the micro-cut shred. These machines shred your document to a very high security level, practically impossible to put back together. Cut type will determine price, as well as speed of your shredder. Strip cut machines simply have much less to do, the motor is much smaller, not as heavy duty and can handle more papers at once. And a micro-cut machine needs more time to process and a stronger motor. Happy shopping, happy shredding and give us a call if you have any questions at all. For more demos, reviews and how-to’s, check out MyBinding.com.